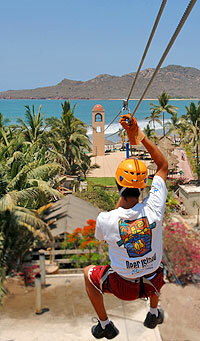 Zip Line and Beach Break Mazatlan - Save 50%! Head to Mazatlan's famous Golden Zone for a fun activity for the whole family! Try a new activity by rock climbing two custom-made climbing walls, then let your adrenaline kick in with two exciting zip lines! The zip lines offer you great views of the outer islands, and the beautiful Pacific Ocean. After zipping, you'll rappel down to the ground, at your own pace. The fun is just beginning, because after your adventure, you can relax at Hotel Playa Mazatlan, using the facilities, including palapas, restaurant and bar, and of course, one of the best beaches in Mazatlan. Swim in the blue waters of the Pacific Ocean, sun yourself on the beach, and sip cocktails the rest of the day. If you like, you can also take a stroll through the Golden Zone and do some shopping after your tour. Test your limits by Rock Climbing on two specialized climbing walls! Fly on two exciting zip lines, 400 feet long, with incredible panoramas of Deer Island! Descend by rappelling down to the ground! Relax on one of Mazatlan's best beaches, and get 15% off food and drinks at Hotel Playa Mazatlan! Runs: Twice Daily Tuesdays and Wednesdays at 12:00 PM and 2:00 PM. Twice daily Thursday through Sunday at 10:00 AM and 12:00 PM. Duration: Adventure circuit is approximately 2 hours. You can relax at the beach as long as you like. Departs: Hotel Playa Mazatlan in the Golden Zone. Use of Hotel Playa Mazatlan Facilities, including restaurant, bar, beachfront palapas, and more. Extra Money for Food, Drinks, Tips, etc. Kids: Ages 8 years old and up. Under 16 must be accompanied by an adult. Compare to your ship's "Zip Line, Rock Wall & Beach Break" Excursion!